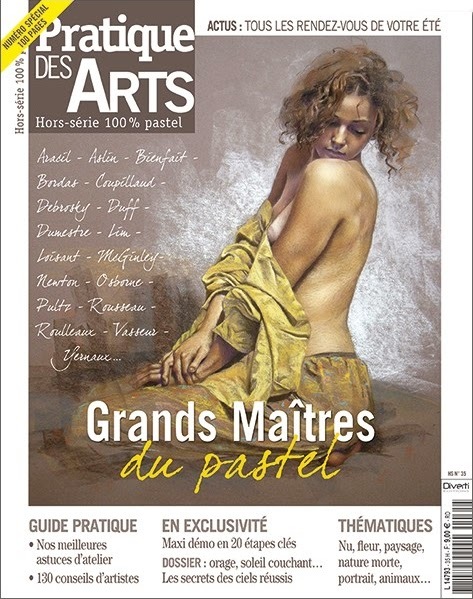 Last September I had the good fortune to be published in a feature article in Pratique des Arts, a well respected french art magazine. About a month ago they repeatedly tried to contact me to be a part of this Grand Masters of Pastel issue but all the emails must have gotten stuck in a filter long before they got to my server. Finally, with the deadline just days away, the journalist sent me an email from her personal account, I got it, was delighted to be included and quickly sent 8 images to choose from and a little text. Voila! I saw the issue cover on Facebook but wondered which paintings they had chosen. A french fb friend kindly scanned the article - thank you Claudia! I am pleased that "Sunset" (above, left) was chosen. 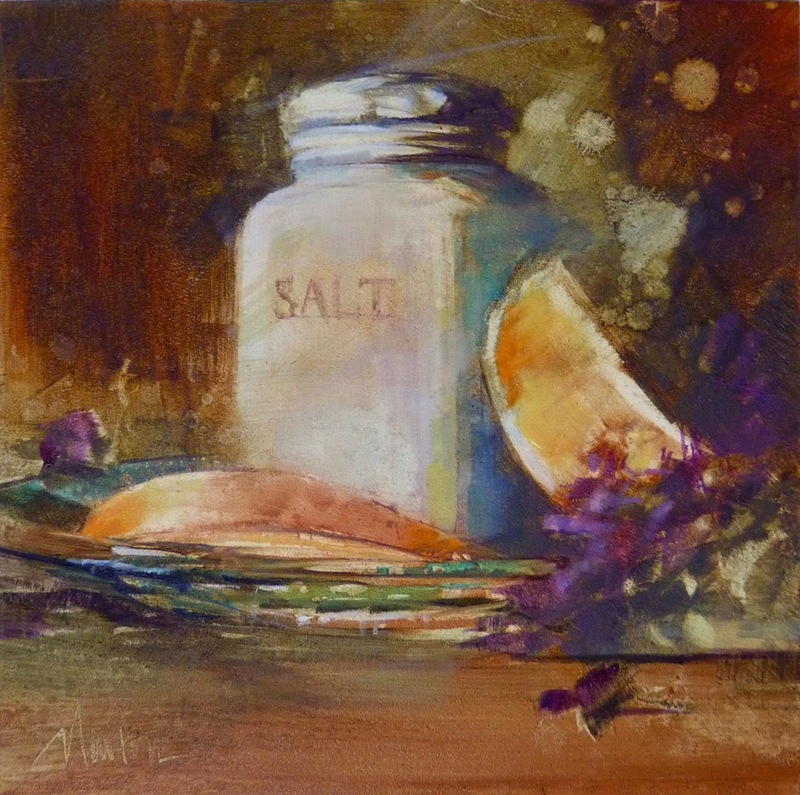 It was sold through Daily Paintworks to a fellow artist. Top right image, "Shades of Summer" is the homepage image on my website and was sold to a collector through Scott Milo Gallery, Anacortes, WA. "Tidal Marsh" is from my abstracted landscape series of a couple years ago. 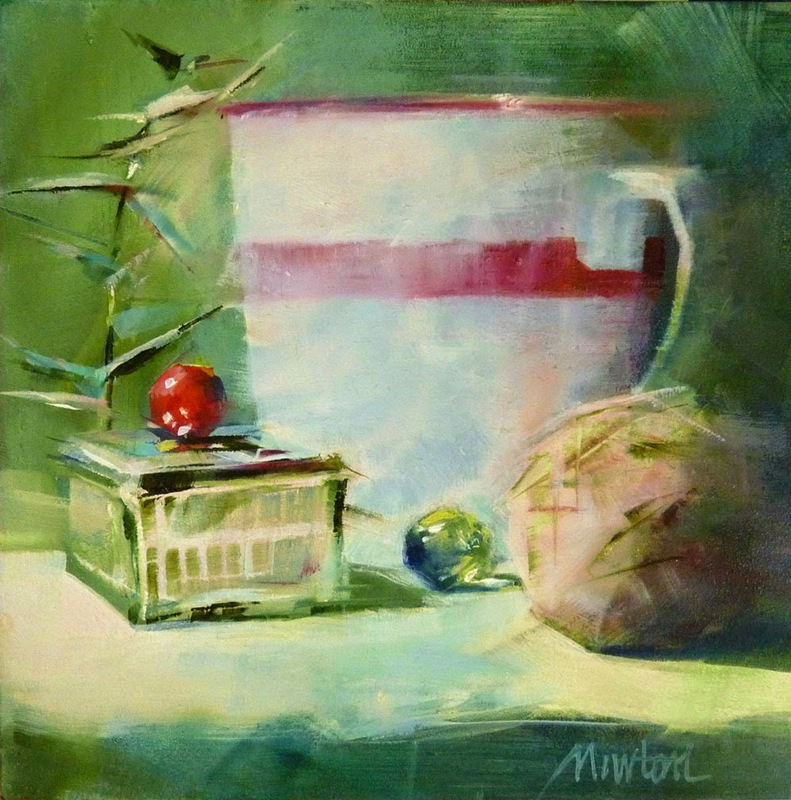 I'm gearing up for a summer of 6x6 still life paintings. To the fabric store for a yard each of seven new colors for the background. Garage sales supply still life objects. 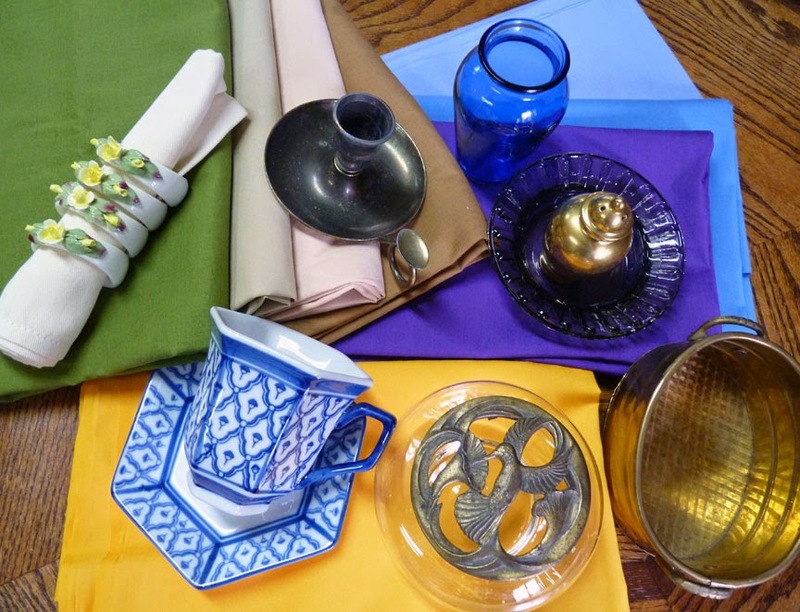 Best find from this group is the set of four Aynsley Fine Bone China, hand modelled, hand painted English napkin rings at twenty-five cents each. 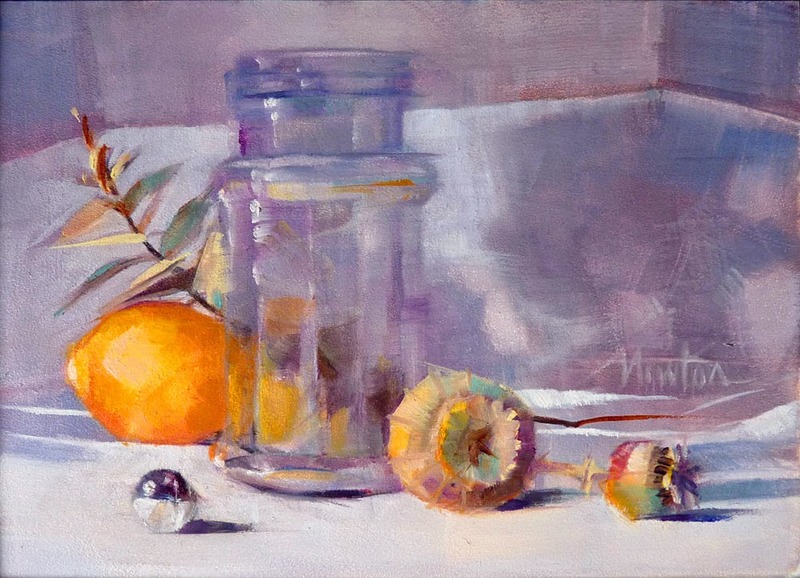 Eight weeks ago, I began painting 5x7 inch oil still lifes then moved on to 6x6 inches. 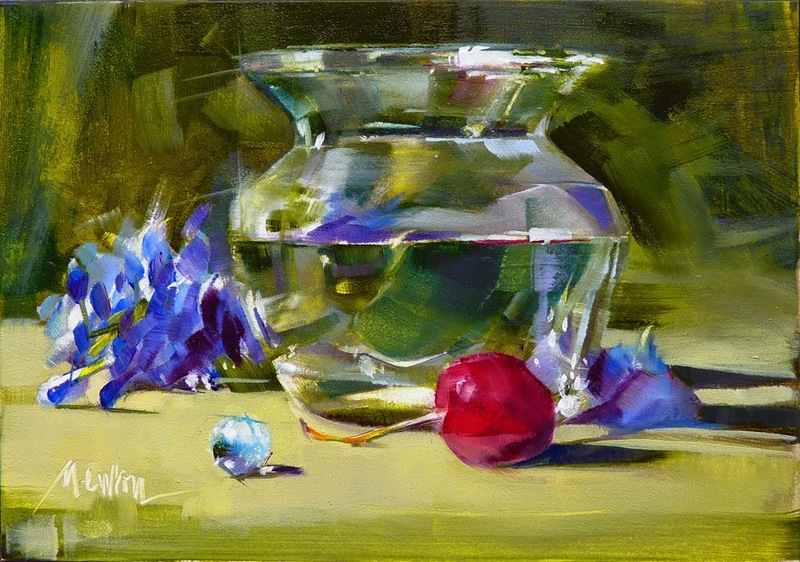 Four weeks ago, I started posting them on Daily Paintworks and on my Studio Sale blog. They received a warm welcome. Today I have only one painting left and I have a problem: Two of my galleries want to show my work of this type, framed of course. 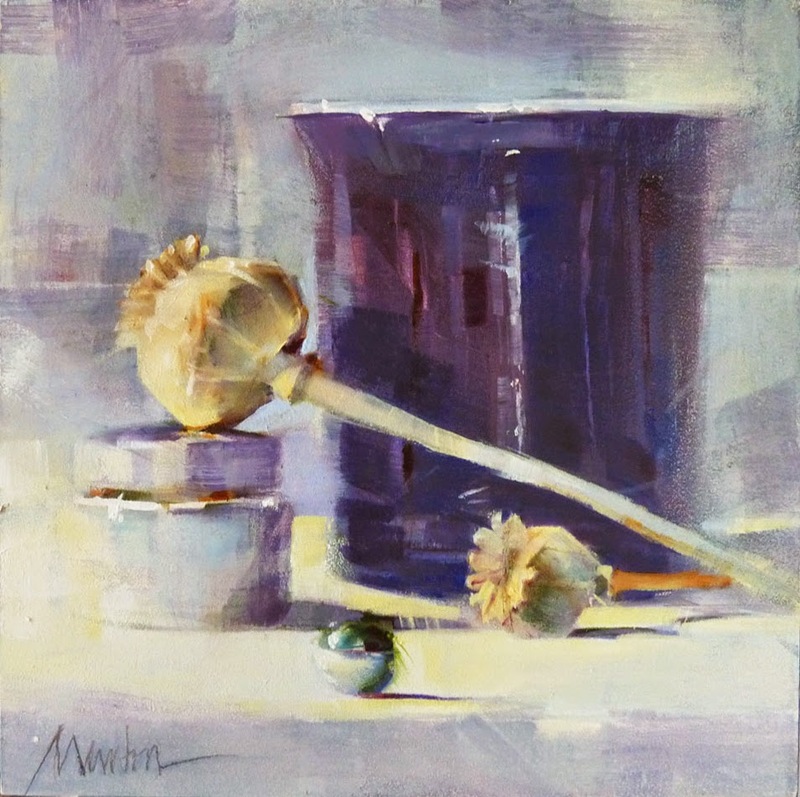 One gallery needs a dozen paintings for a Featured Artist event in the fall. 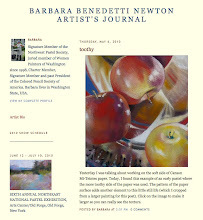 So, it is bittersweet that next week I will post my last painting of this series on DPW and turn my attention to filling my gallery commitments. 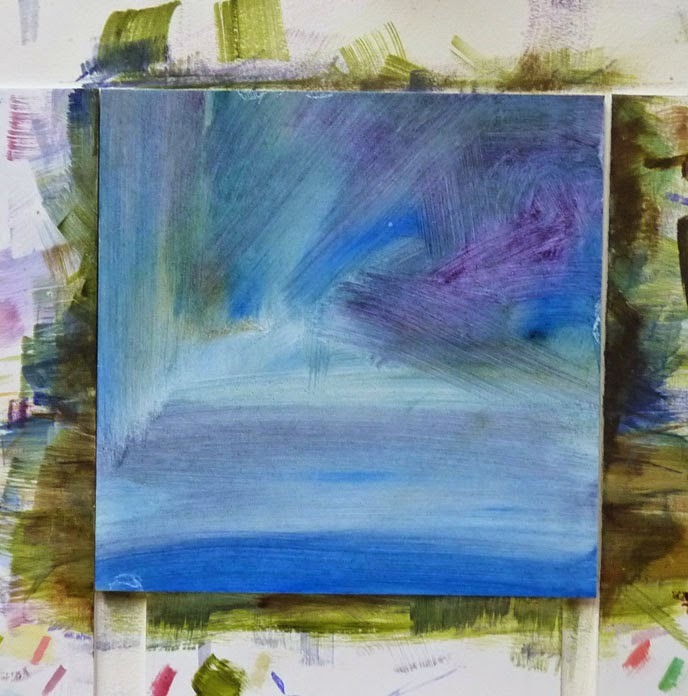 Currently, "Beginnings" is available for purchase on my Studio Sales blog but I plan to post it on DPW Monday, June 30th for a 7 day auction. 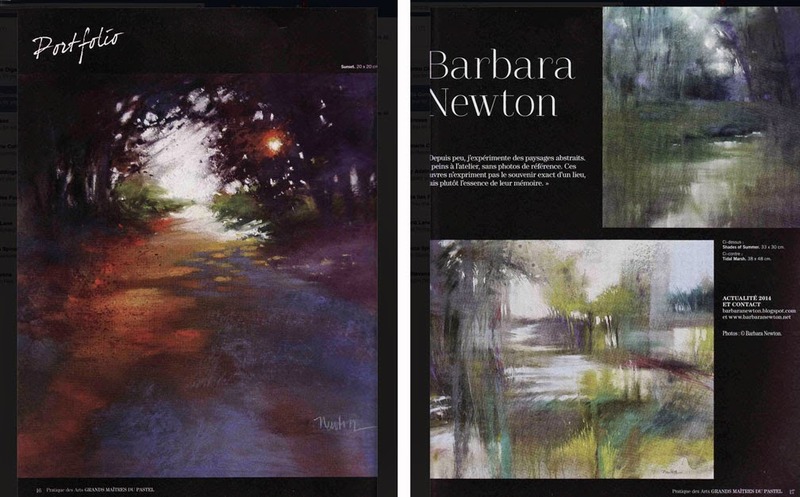 My sincere thanks to all who have purchased these little scenes. You have each played a part in encouraging me to explore a new direction. Here is the reference photo and step by step shots of today's painting. The reference photo is for composition only (step 2) - useful if I have to dismantle the scene and set it up again. I paint using the actual still life set up as reference. When I worked in colored pencil, I had the best titles for my work! Heartfelt, September Song, One Fine Day, Long Ago and Far Away, Comfort and Joy. I've decided to start reusing titles. Today's piece is called Comfort and Joy. And, just to amuse myself, I will post the original Comfort and Joy below today's version. Remember my red-danger-stop post? You know, the one about the cottage cheese? Well, I learned my lesson about red long ago and didn't touch that red knob again until the finishing touches. Can't say the same for the rest of the painting but I'm pleased with it now. 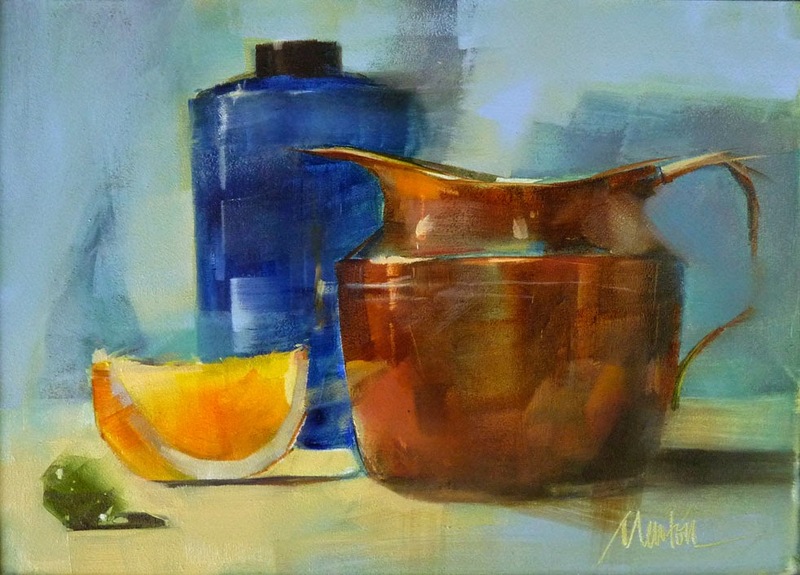 My little oil still-life experiment has grown into two of my galleries wanting to show this work. 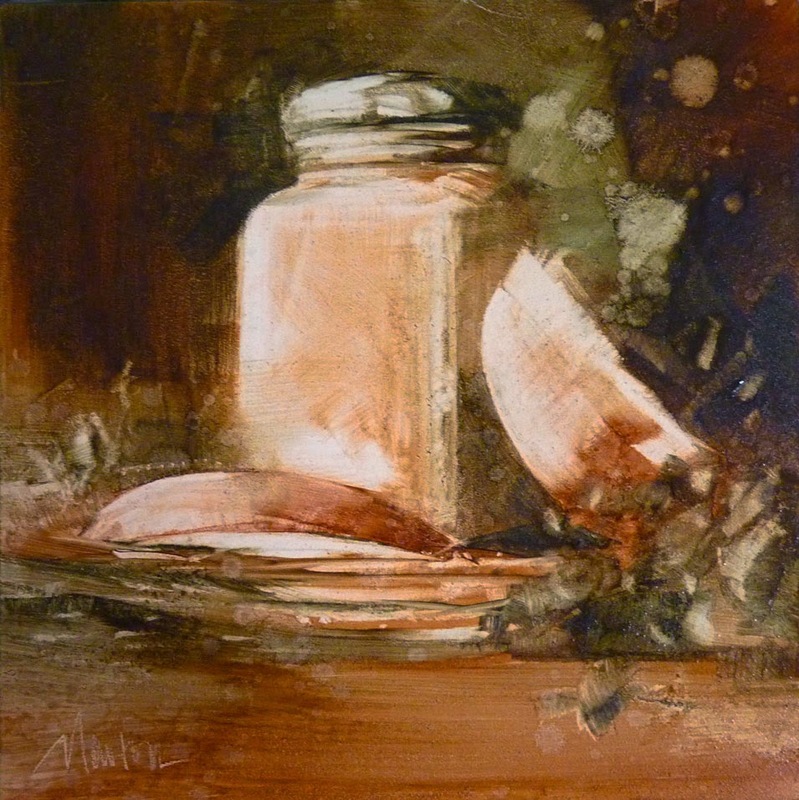 It means I won't have as many (or any) to sell on Daily Paintworks. 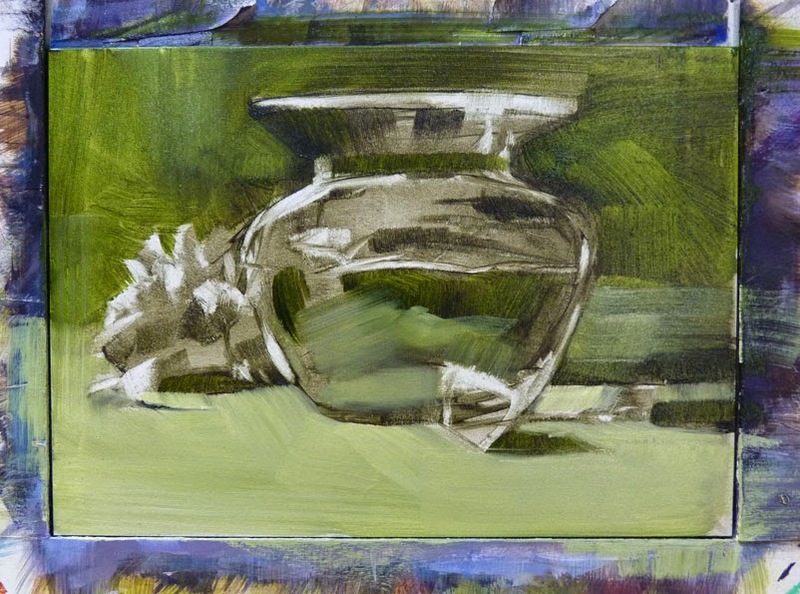 I continue to focus on small still life paintings. I'm comfortable now with my oil technique but this week I changed my process a little. I'm completing the value stage and then moving on to another painting. When I get a couple more of these I'll go back to the first one and begin to add color. My reason is two-fold. 1. To let the value dry before adding color. Although this will limit my ability to remove paint back to the white surface, it will also limit my ability to remove paint when I should have left it where it was. 2. To distance myself emotionally from the composition and value stage, hopefully to approach the color work with fresh enthusiasm. I'm always looking for ways to make better paintings. Now, the obstacle is not materials or technique but instead, my inner dialogue. Find ways to free yourself to create your best work. When I took Home Economics in school, I was given 3 pieces of cut cherry tomatoes, a leaf of lettuce and a blob of cottage cheese to arrange into an attractive presentation. Other students completed the task in minutes and so did I but then...I decided the tomatoes would look better like this...no, like this...NO, how about this? By the time the teacher arrived to grade me, I had pink cottage cheese. When working with red, walk away! 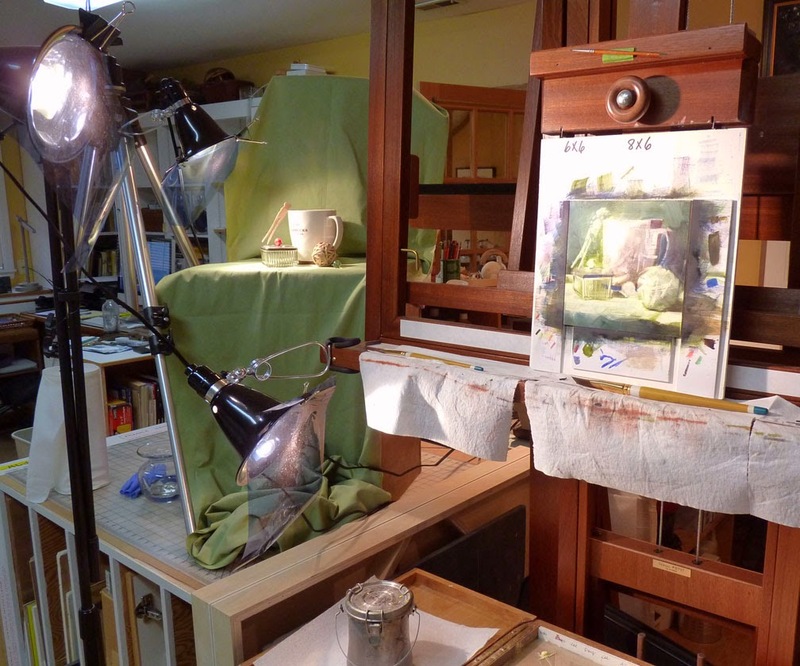 If you look closely at my still life set-up, you'll see the red knob on the glass box. Now, I'm walking away to attend my Critique Group meeting. Added SALT and a little color. 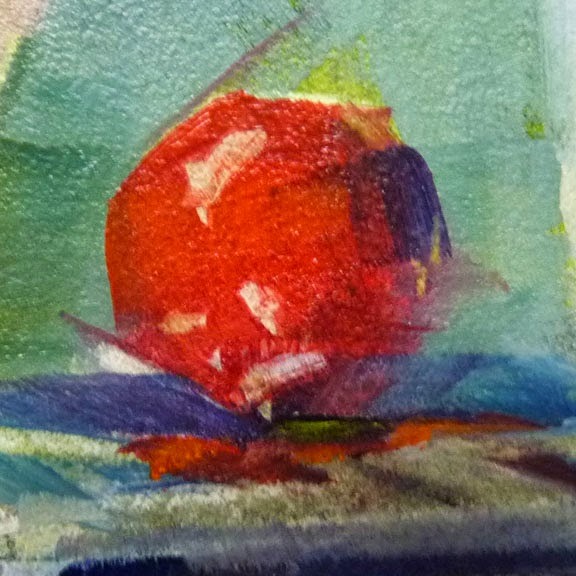 This painting was difficult to photograph - this image looks a little too warm but I can spend another hour on adjusting the color or I can get to the easel and have a good morning. Wishing you the same. A Good Morning in progress. I think it needs SALT. This stage of painting is exciting to me and I want to hold that feeling. A few more thoughts on that here. Ahhh...my brushwork is getting looser and I'm happy. Note to self: if you can't paint a marble in six strokes, walk away, take a break. You are hungry, tired, over-marbled! 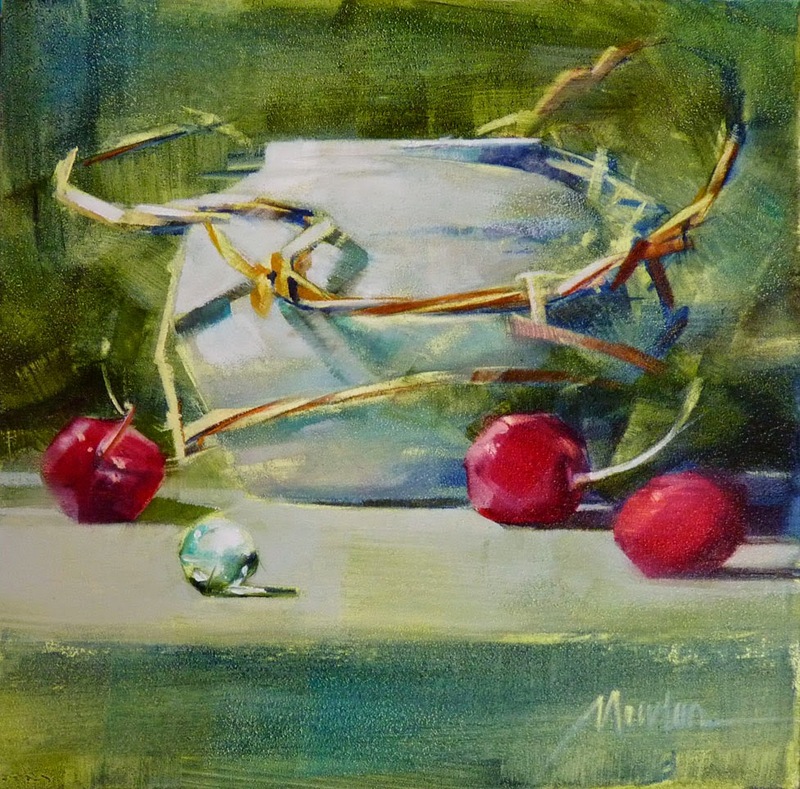 Yesterday's painting shows my "steely" marble. Do they still make those? 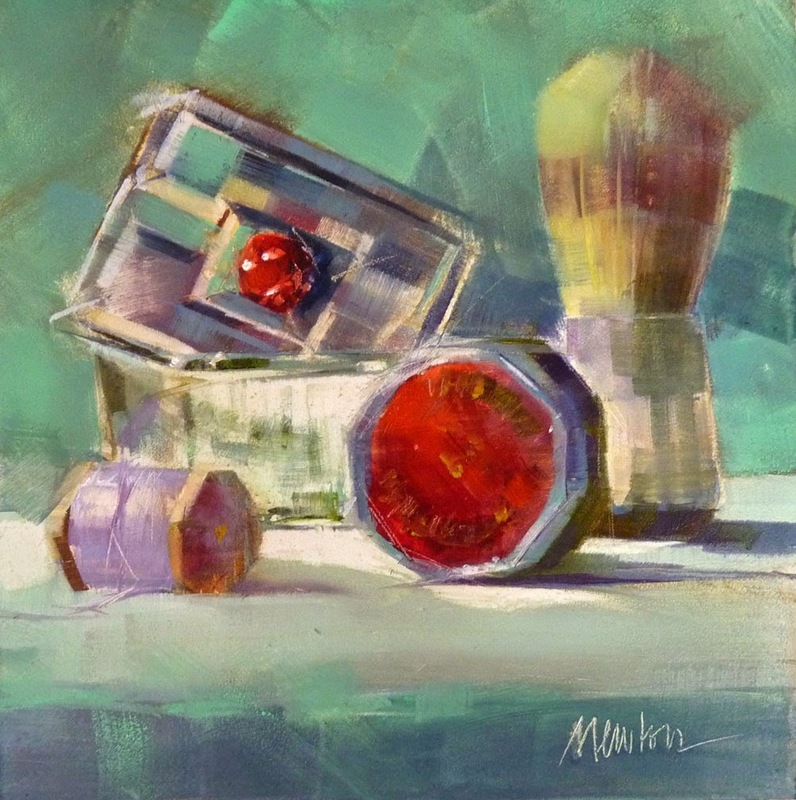 I'm still working on lost and found edges and am happy with today's painting, 6x6 inch "Faithful." The color and feeling of the actual painting seems more lively and delicate than this image but this is as close as I can get today. Many times, the business of art takes more time than the actual painting. So happy to have successfully lost the edge on my green marble! It took about six tries, even wiping all paint off and down to the clean white Ampersand panel but I finally got it the way I want it to look. This is the final 5x7 inch painting of my self-imposed discipline about handling oil paint and I have learned a lot. Each of the the twelve paintings has lessons learned and special meaning to me. 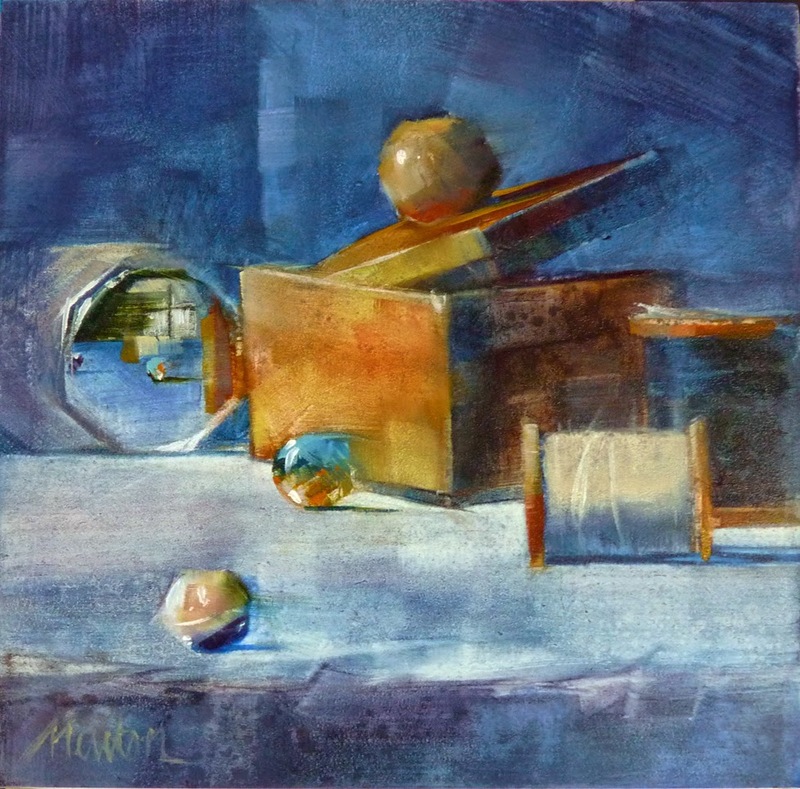 As I send them on to new homes through Studio Sales and Daily Paintworks, I find I am missing them. But now, on to a different size and my quest for lost edges and being lost and focusing. A few more thoughts and a link to interesting reading here. Last night as I was painting on Little Oil #12, the final painting of my "Figure out how to handle oil paint!" series, I had a major breakthrough. 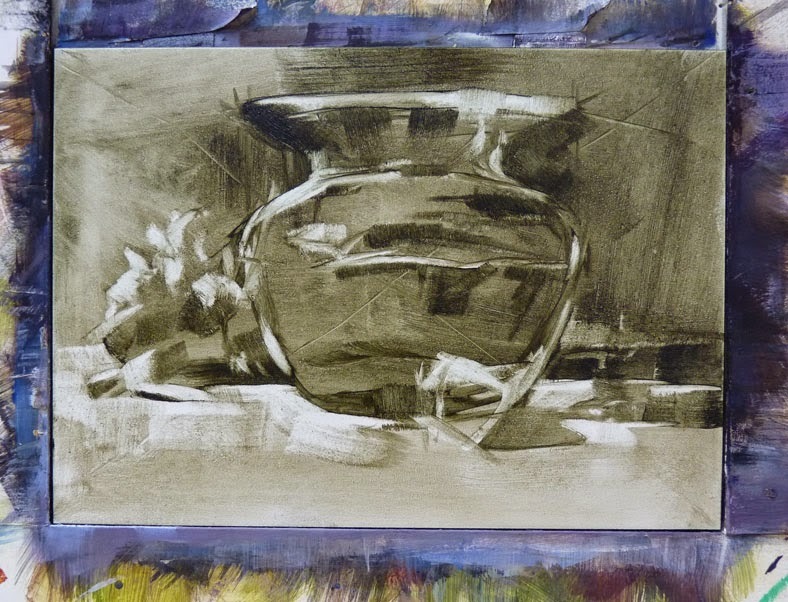 The value study was a combination of Naples Yellow Light, Sap Green and Ultramarine Blue. 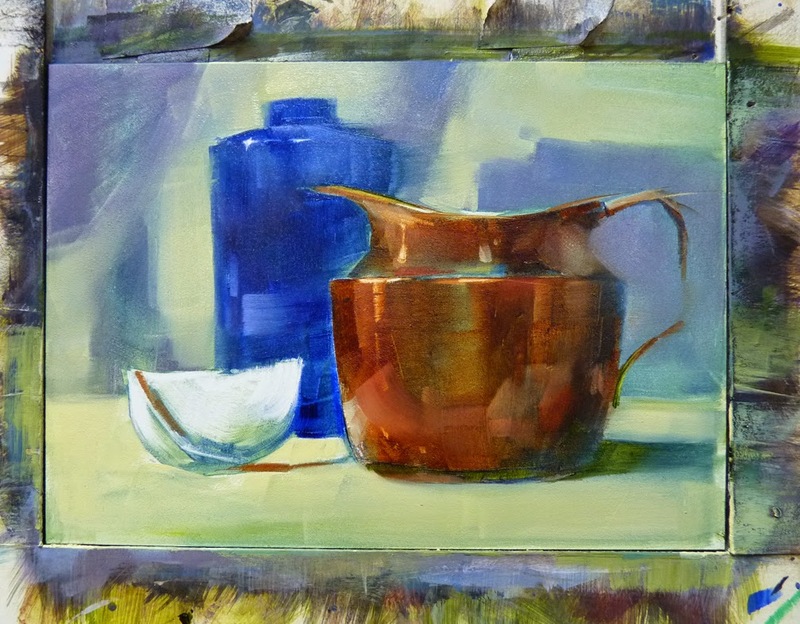 When I applied the local color, Burnt Sienna, to the little copper pot it practically painted itself. Now, that's the way it is supposed to be! Fresh, and lively the first time, with no second (or third or fourth) effort to get a fresh look. Whew! Just in time. I want to go on to a larger painting. All twelve of the little oils will be posted for sale. "Blessed" is first up and is now on the DPW auction with very good traffic stats, followers and bidding with 5 days to go. I know not everyone likes the auction process so I will post these paintings June 4th on my Studio Sales blog for purchase directly from me using Pay Pal. 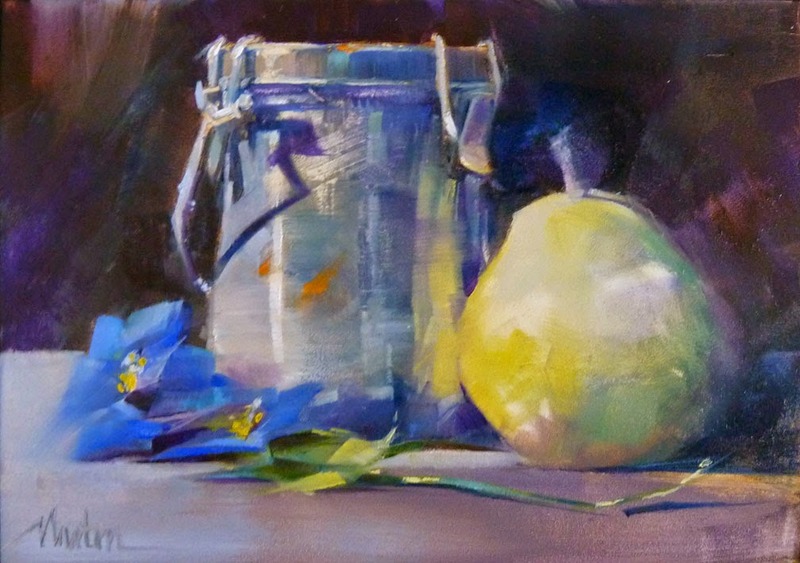 If they don't sell on Studio Sales, I'll offer them at auction on Daily Paintworks. The composition and value for "Deliverance"
I'm observing how the creative process varies for me depending upon the medium. 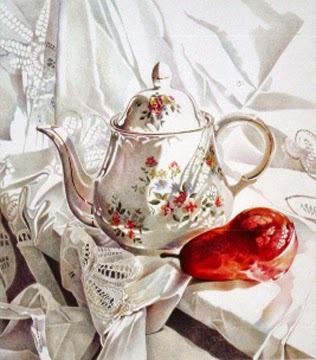 With colored pencil, it was careful step by step tedious rendering. Mistakes were made so slowly that I usually caught them in time to correct them. With pastel, I painted with abandon and if things weren't going well, I just washed or brushed the painting off and began again to keep a fresh look. OIL: a whole new ballgame. Toning the board is carefree. The value step is easy. Local color comes next and I have to force myself to spend time to get the exact local color that will be compatible with shadows and highlights when I get to the modeling of the form. In the reconciliation step, I always like to add a surprise of color but it must work with the local color of all objects. 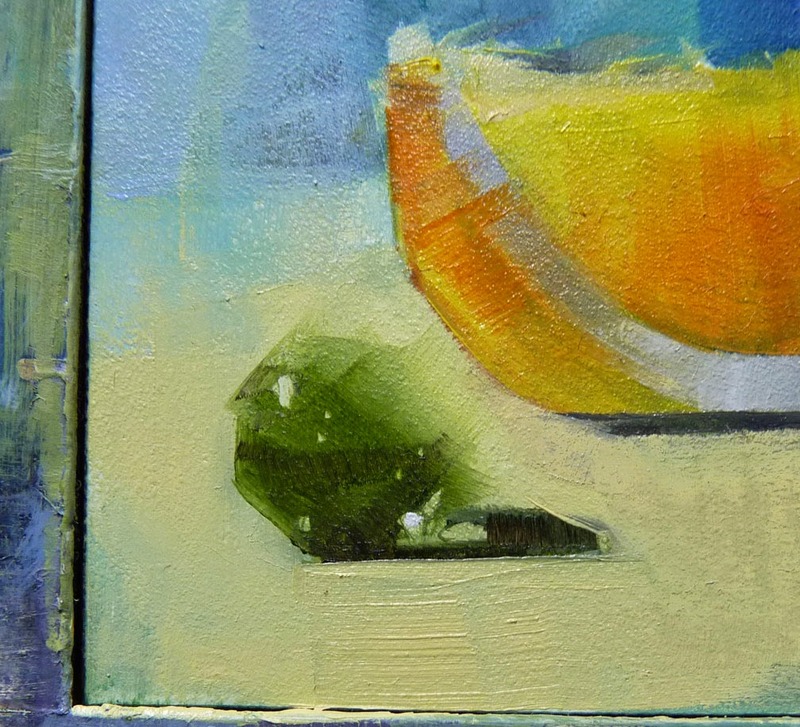 As always, the painting is about light and the way it affects color, texture and shape. It would be a good idea for me to be working on several oil paintings at the same time, each in different stages of completion. 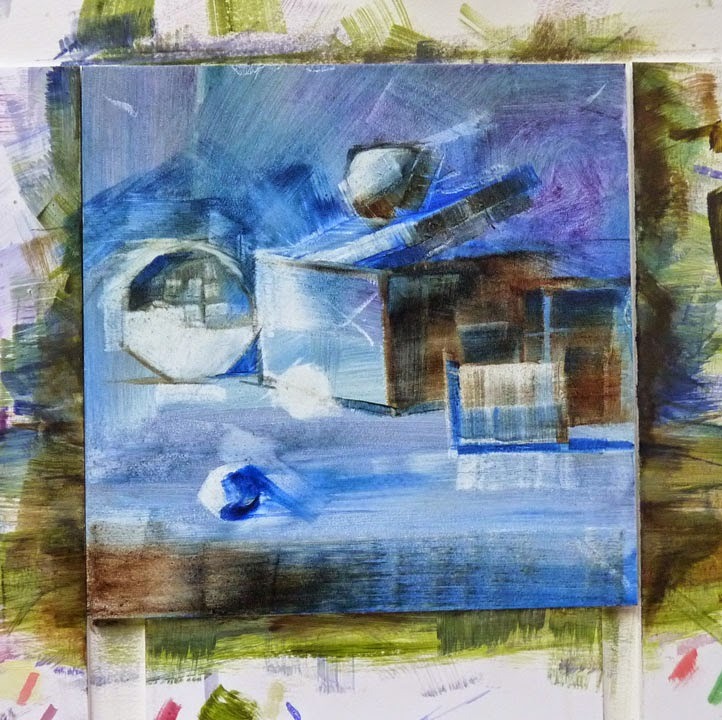 Today's painting, #10, "Arcana" was fun to paint, but difficult to photograph. 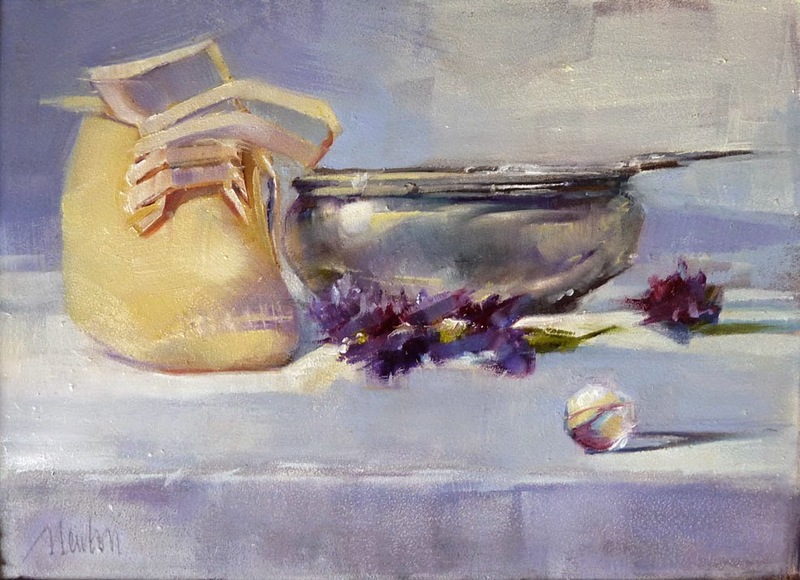 "Blessed" is the painting currently on auction at Daily Paintworks.